Hard cover book by author Bruce Cochran. Book size is 9" X 6" with 96 pages. During those cold and blustery fall days when most folks remain sanely and snugly indoors, a crazed, camouflaged contingent of comrades are out and about in the soggy wetlands—call them waterfowl hunters. Theirs is a world of wet dogs, dripping noses, frozen fingers, jammed shotguns, and (sometimes) the miracle of ducks and geese alighting in their decoys. And they call this fun. 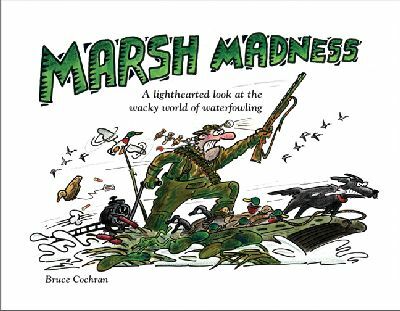 Marsh Madness is a hilarious cartoon tribute to these self-deprecating hunters who will see themselves and their friends in each page of this insightful book from bestselling cartoonist Bruce Cochran.